Founded in 1912 as the Metal Office Furniture Company in Grand Rapids, Michigan, Steelcase is over 100 years old. Our innovation legacy began in 1914 when we received our first patent for the manufacturing process developed to make a strong, durable, low-cost fireproof wastebasket – a major innovation at that time. Steelcase was founded in 1912 by a few people with a strong commitment to integrity and doing the right thing. Their principles became the foundation of our company, passed on from decade to decade. Our employees are our greatest asset and living these values is at the core of all that we do, just as it was in the past. Our first patent in 1914 led to metal desks. And we’ve led the way with product and service innovations ever since. Our portfolio of solutions addresses the three core elements: interior architecture, furniture and technology. All brands design for social, economic and environmental sustainability. For over 105 years, Steelcase Inc. has helped create great experiences for the world’s leading organizations, across industries. We offer a comprehensive portfolio of architecture, furniture and technology products and services designed to unlock human promise and support social, economic and environmental sustainability. We are globally accessible through a network of channels, including over 800 dealer locations. Steelcase is a global, industry-leading and publicly traded company with fiscal 2017 revenue of $3.0 billion. We demonstrate all this through our family of brands – including Steelcase, Coalesse, Designtex, PolyVision and turnstone. We share our diversity education endeavors company-wide with “Think Sessions,” or assemblies, designed to provoke discussion among leaders about creating a diverse workplace. Steelcase also partners with several organizations to bring influential speakers to the community. Working with Grand Rapids Community College, TED and the World Affairs Council, we’ve hosted B.D. Wong, Eric Alva, and Prince Cedza Dlamini, among others, who have shared new ways of thinking about diversity and inclusion. Steelcase demonstrates our company-wide devotion to global inclusion with EEO and diversity training. Since the early 1980s, EEO sessions have been required for all employees, in order to improve harassment awareness and leadership skills. Since our company’s founding, we’ve placed a great emphasis on thinking and acting with integrity. Our corporate standards reflect that by surpassing legal and regulatory requirements in countries where we do business. 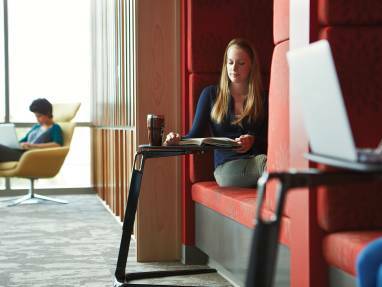 In 2000, Steelcase began providing Global Business Standards training to Steelcase employees worldwide to encourage the practicing of good business principles. Additionally, we encourage our dealers, suppliers, service providers, consultants and business partners to operate with integrity. As a company, we are committed to embracing and exploring all aspects of diversity from employee education to dealer and supplier relationships. We focus on increasing our employment diversity by regularly reporting measures to senior leaders. Many of our employees dedicate time and effort to bridging cultural gaps. A number of Steelcase employees have spoken publicly on topics regarding diversity and inclusion. Several company leaders serve as board members and active members of organizations focused specifically on global inclusion efforts. Steelcase has a number of internal groups focused on diversity and inclusion efforts. The Inclusion Partners group at Steelcase was formed in 2008-2009 to better the work experience of all employees. The group includes 20 employees around the globe and meets once a month to discuss ways to increase employee understanding and awareness of the many diverse characteristics that comprise our company. Another internal group that enhances our global diversity efforts is Inclusive Partners. 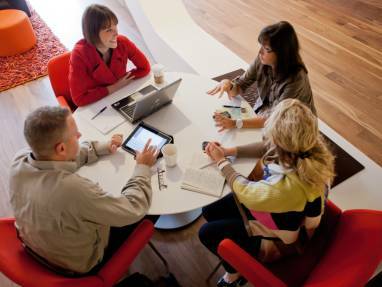 Steelcase is a corporate member of Inforum, a professional women’s alliance in Michigan. With more than 2,000 members, Inforum’s mission is to strengthen the business environment in Michigan by creating opportunities for women to lead and succeed. Several female leaders at Steelcase were charter (founding) members of the West Michigan chapter of Inforum, which has over 500 members representing most of the major companies in the region. Steelcase’s Diversity Forum is a periodic meeting of company leaders. If you’re looking for a company that is authentic and reliable – one that allows you to do your best work as a part of a team passionate about finding solutions and doing things right – we invite you to check out our opportunities. Steelcase has a global initiative to benefit the communities in which we live in. Since our founding in 1912, we’ve made community support efforts an integral part of our operations. We continue to grow as a business by giving back to the communities that support our company and our lives. In addition, we strive to be sustainable to encourage a healthy environment, community and company for years to come. Likewise, we make it a priority to support communities that are within need of our resources. 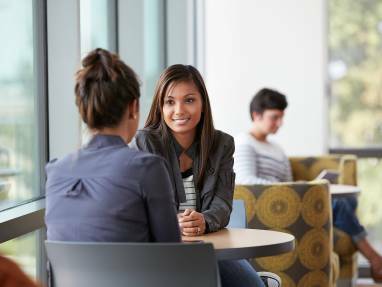 Steelcase gives our time, talents and treasures to programs that specifically focus on our values: community and economic development, education, human services, arts and culture, and sustainability. cultivate an environment that attracts and retains talented, high-performing people. Our goal is to develop and maintain a robust supply base of Qualified Suppliers aimed at providing lowest total costs and exceeding our customer expectations. Our qualification process is designed to gradually share information about each other, so we can each make clear decisions whether or not to continue the process. Our objective is to qualify suppliers with the best capability match to our business needs. Qualified Suppliers must successfully complete a process and fulfill agreed upon requirements. Our qualification process includes research, evaluation, agreement, as well as ongoing monitoring and measurement. Our Qualification Leaders develop a candidate supplier list from various sources, including our database of potential material and service providers. The database is populated by inputs from our global Supplier Questionnaire. A supplier is selected from our qualified suppliers. We award business based on the supplier’s ability to meet specific requirements of a Schedule Agreement that includes line items such as quality, reliability, total delivered cost to point of use, environmental impact, etc. We manage our suppliers with our customers in mind. We monitor our suppliers’ performance to ensure the products and services they provide meet or exceed the agreed upon terms and conditions. Prior to providing you access to Steelcase Engineering Specifications you will be required to sign a confidential disclosure agreement. Steelcase and the supplier agree to certain terms and conditions of our Global Master Agreements. We have several types of agreements based on what is being purchased. The Master Agreement describes the general terms and conditions governing any purchase of product, material, service, or equipment by Steelcase from a supplier. Qualified suppliers have appropriately demonstrated documented and implemented primary business processes and any special processes (welding, coating or adhesives). We work with our suppliers to mutually serve our customers and shareholders. Together, we strive to meet and exceed quality standards, improve efficiencies and effectiveness, and manage resources and costs. We have established guidelines, tools and programs to enhance this outcome. Chief among these is the Steelcase Supplier Code of Conduct. This is our invitation to you to tell us about your company whether you are based in New York or New Delhi. Suppliers providing logistics services like Full Truckload, Less than Truckload, Brokerage, and Warehousing should complete the Logistics Supplier Questionnaire. All other suppliers should complete the Supplier Questionnaire. SupplySync is a private, Internet-based exchange that connects Steelcase with its supply network. The exchange provides a wide range of business services for both indirect and direct material suppliers. If you are already a Steelcase supplier, your buyer or primary contact at Steelcase can share more about SupplySync with you. If you are interested in becoming a candidate supplier, please fill in our Candidate Supplier Questionnaire form. Our CEO, Jim Keane, has expressed to internal and external audiences – including nearly 200 people at the 2012 Steelcase Supplier Summit – that it’s not companies that survive for 100 years, its ideas. And Steelcase has been centered on one core idea for over 100 years – we unlock human promise. We also believe there is opportunity to unlock human promise in the development of a diverse supply base. Since 1991, the Steelcase Supplier Diversity Program has focused on promoting the growth and development of minority-owned, women-owned, service veteran-owned as well as service-disabled veteran-owned businesses and HUBzone in the United States by integrating them into our procurement process. Here at Steelcase, we review our corporate supplier diversity goals monthly. In addition, we continue our involvement in conferences and networking opportunities to make connections with more potential suppliers. Our Supplier Diversity vision is to grow, develop, and retain our diverse businesses by creating the best supplier diversity program that surpasses the requirements of our industry and customers. Advertising in publications that serve our diverse business communities. Maintaining active membership in the National Minority Supplier Development Council, Michigan Minority Supplier Development Council (MMSDC), Michigan Chamber of Commerce, Michigan Manufacturers Association, The Right Place, Inforum, Business Leaders for Michigan and the Grand Rapids Area Chamber of Commerce. The MMSDC awarded us their Corporate One Award for 10 years of excellence through our involvement and support.